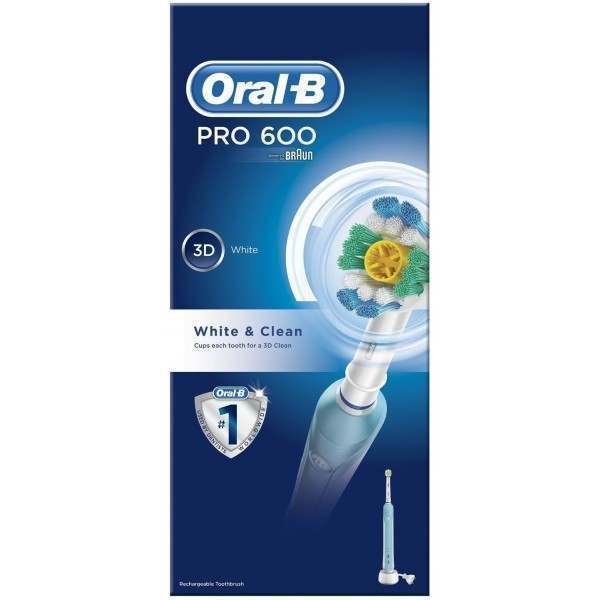 The Oral-B Pro 600 electric toothbrush has been professionally designed with the 3D White toothbrush head, to provide a brushing experience that surrounds each tooth for individual cleaning. Easily maintain your toothbrush with Indicator bristles which fade halfway as a sign to replace them. 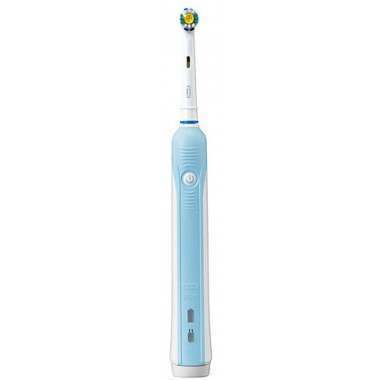 The Oral-B PRO 600 electric toothbrush provides a clinically proven clean vs. a regular manual toothbrush. The professionally inspired design of the 3D White toothbrush head is designed to gently remove surface teeth stains. It features a dentist inspired rubber polishing cup for advanced cleaning and whitening results. It also surrounds each tooth for thorough cleaning and 3D cleaning action oscillates, rotates and pulsates to break up and remove up to 100 per cent more plaque than a regular manual toothbrush. The 3D technology: 8,800 oscillations/rotations per minute and 20,000 pulsations per minute. An in-handle timer helps you brush for a dentist-recommended 2 minutes. Brought to you by Oral-B - the #1 brand used by dentists worldwide. Achieve a thorough tooth-by-tooth cleaning experience, with the 3D White toothbrush head surrounding each individual tooth.